Feel the hammer! 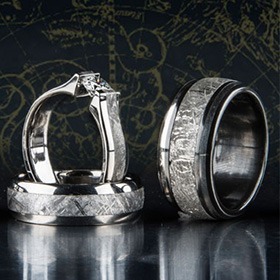 Our series of hammered wedding rings is a collection of pulse-pounding favorites that change everything you thought you knew about jewelry. Featuring bands made from titanium, cobalt chrome, black zirconium, and more, each ring in this thundering collection is a brand new take on form and style that is not for the faint of heart. The only question is, are you ready? All of our hammered rings are made to order and are built to set themselves apart. 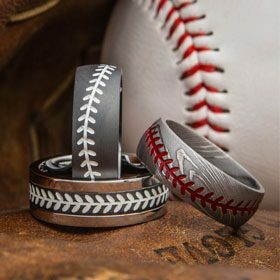 Their character is shaped, or we should say beaten, right into the most durable materials ever used to create wedding bands. They may have taken a pounding, but they're going to look great for a lifetime. Need an idea of where to start? Try a unique take on a timeless classic with a Dome Profile Hammered Ring, or step it up a notch and go with a cool Square Hammered Ring. Remember, your ring is something you want to have forever, and you want it to fit into your lifestyle. Why not go with something that's as unique as you are? Have a questions about one of these designs? Want to create a style of your own? Whatever you need, we can help. Call us at 1-866-215-1861 or send us an email and let us know what you have in mind. Want more from the forge? 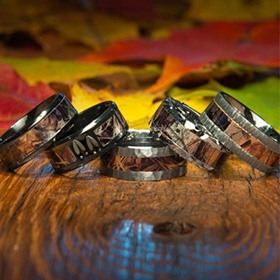 Check out our expanded Rustbelt Line of copper wedding rings. 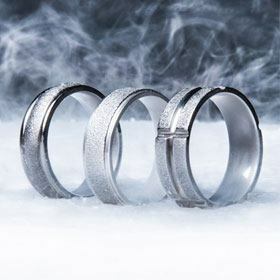 Learn more about different wedding bands for men in our huge collection.